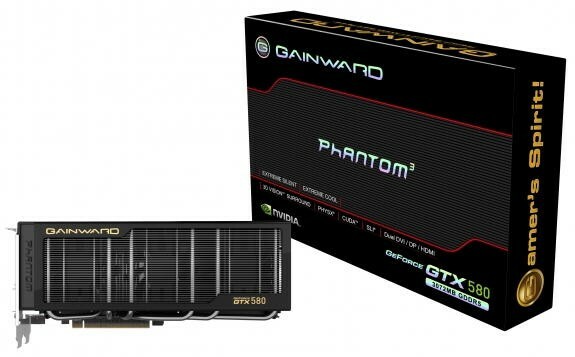 Gainward Intros its Geforce GTX 580 Phantom Edition Card with a Massive 3GIG Memory. This memory is spread across 12 2GB Memory chips on the PCB along a 384-bit wide GDDR5 memory interface. Packed with 512 Cuda Cores the card sticks with Nvidia’s Reference clocks for GTX 580 783/1566/4020. The PCB is colored Black and the heatsink also comes with a Black Aluminium Fin Array to which heat is transferred by six heatpipes and is cooled by fans inside the heatsink block which draw air from the aluminium block and throw it towards the PCB hence giving the Cooler a neat look. The GPU comes with two DVI, and one each of HDMI and DisplayPort. The card will sure cost a bit more than the Reference card but at whatever cost its launched it’ll worth it.